See her? The woman behind the rock? The one with a Glock 43 in her hand? That’s Schae Summers, fantasy author. She only came to Scotland to do some book research. Not to be chased over the heather by a wolf. Because everybody knows there aren’t any wolves in Scotland, right? Well right now Schae’s wishing someone had told the one behind her. But being chased is one thing—even if it’s by a wolf. Being chaste? That’s something else entirely. Especially where men with storm grey eyes are concerned. Men like Darek Banakar—who just might be more dangerous than any wolf. Well I think this has to be one of the most unusual books that I have read. At times very bizarre but always totally mesmerizing. I loved Tatter Jack’s writing style that is very poetic without being poetry and I felt myself being swept along yearning for the happiness of the main character, Schae, more so in fact than she dare wish for. There were passages and chapters in this book that I re read again, not because I didn’t get it, but because I did and it was written in such a way that I wanted to feel that emotion again and it was still as powerful. I am a sucker for romance and under dogs and everything that is impossible being possible and in this book I got that. I felt the vulnerability and shame when there shouldn’t have been any and desire and love and the humour because I laughed too. At 17 Schae had been found in an hospital bed in a terrible condition, her body scarred and not remembering anything so the staff named her in a raffle competition. 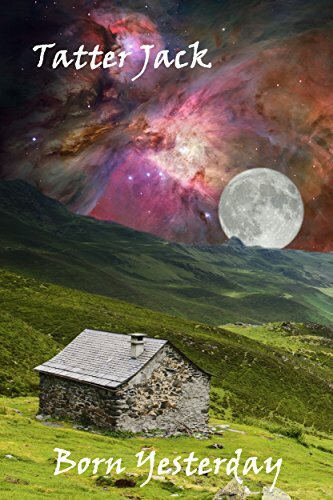 Fifteen years later American Schae arrives in Scotland to follow research for her latest Fantasy novel, where she gets most of her story lines from her vivid dreams. It is here that she encounters a wolf that shouldn’t exist in Scotland and Darek Banakar, whom she simply can’t resist. Now there are some steamy scenes so you have been warned. This was far more than desire. This is story of discovery for Schae, something that even her dreams hadn’t been able to conjure. Tatter’s an ol’ Irish word meanin’ ‘father of the clan’ . Well, that ain’t me. I’m just ol’ TatterJack. I been walkin’ these hills, tellin’ my tales, since they was bloody mountains. I been doin’ it so bloody long, there’s some as tells tales about _me_ even. Like how if you stand with your back to a mirror, an’ says my name, an’ says it three times forwards an’ one time back, an’ three times back an’ one time front, how I’ll come. An’ they’ll say all sorts of things what happen next. But it’s all rubbish. ‘Cos first, I don’t come when I’se bloody called, not to no-one. An’ second, I don’t rip out your innards to make my stew neither. Well, not very often. But if ye find me on the Road, we can sit us down, an’ we can set us a fire, an’ I’ll Tatter’s an ol’ Irish word meanin’ ‘father of the clan’ . Well, that ain’t me. I’m just ol’ TatterJack. I been walkin’ these hills, tellin’ my tales, since they was bloody mountains. I been doin’ it so bloody long, there’s some as tells tales about _me_ even. Like how if you stand with your back to a mirror, an’ says my name, an’ says it three times forwards an’ one time back, an’ three times back an’ one time front, how I’ll come. An’ they’ll say all sorts of things what happen next. But it’s all rubbish. ‘Cos first, I don’t come when I’se bloody called, not to no-one. An’ second, I don’t rip out your innards to make my stew neither. Well, not very often.